Congratulations to Amelie on winning our Grand Prix P Pod prize draw! SOS Marketing Manager Tom Jarvis took a trip to Essex to meet the winner and catch up with Mum Tania. Amelie is a lovely, smiley 9 year old girl from Essex. She goes to a local Specialist school and lives with mum Tania and her older brother. She is a regular visitor to Great Ormond Street Hospital has endured several operations to help stimulate growth and maintain her back and hip alignment. When Amelie is at home she spends most of her time sat in her wheelchair or carefully positioned on the sofa. When Amelie wants to relax Amelie’s Mum Tania would position Amelie on the sofa which has its draw backs. 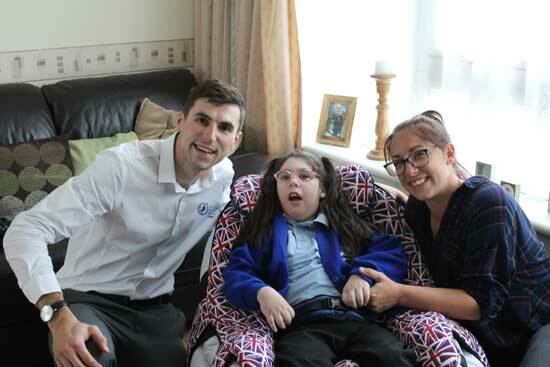 Amelie has the most severe and disabling form of cerebral palsy; spastic quadriplegia she is also Hypertonic – she likes to push her hips forward when she is uncomfortable making it hard to keep her in a secure seating position. Amelie is also partially sighted and enjoys using an iPad so ideally needs to be positioned in an active position from time to time so she can see the screen. Amelie’s Step Mum Elizabeth entered our prize draw to win our limited edition Grand Prix Themed P Pod. Out of the 100+ entries we received, Amelie’s name came out on top! A very excited Elizabeth helped arrange for us to deliver the P Pod to mums house so that Amelie can use it every day. Step Mum Elizabeth said “Amelie is a gorgeous little girl with a wicked sense of humour and a smiley personality. She laughs and smiles all of the time. She would gain so much pleasure from the p pod as a comfortable alternative to her wheelchair. I am so excited for Amelie! I am sure she will love her new P Pod”. After speaking to Elizabeth and finding out more about Amelie, We decided to add a Beanbag Lap Tray and Activity Frame to the prize so that Amelie could get more out of her new P Pod. On Monday 25th September SOS Marketing Manager Tom Jarvis visited Amelie and Mum Tania to set up the P Pod and meet the winner. “The Lap tray will allow Amelie to use her iPad more comfortably. Although she will push her arms back some of the time, the iPad and other games like sensory lentils, sand and bubbles will help stimulate her and encourage her to reach forward to play. Thank you SOS and Newlife”. It was great to see Amelie sat in her new P Pod. We wish Amelie and her family all the best for the future and congratulations on winning the prize draw. The Grand Prix P Pod prize draw was ran in association with Newlife Charity for Disabled Children. Based in Cannock Newlife help provide thousands of items of specialist equipment with fast tracked delivery to prevent suffering and for when time is very precious. The charity also provides support to children and families whilst funding research to improve child health. Specialised Orthotic Services have been supporting Newlife for several years. One of the ways we support the charity is through Newlife’s Emergency Equipment Loan Service, allowing our special seating to be loaned at very short notice to children with severe and terminal conditions. The P Pod was designed by the SOS upholstery department. With the Formula 1 championship returning to Silverstone over summer, we decided to do something racing themed to celebrate. We would like to thank all of the entrants who made a donation to Newlife. The prize draw raised a total of £200. We would also like to add a special thank you to Amelie’s Dad Louis. After finding out that Amelie had won he very kindly made a donation of £200 to Newlife to say thank you. This brings the total raised to £400!